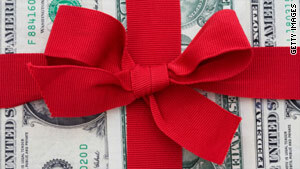 People find great ways to have holiday fun and not all of them include giving gifts that require cash. Coupons, coupons, coupons! I begin early, and I'm diligent. Start collecting them, make your list, then try to use at least one coupon for each person. The savings will be dramatic. The trick? Don't buy more just because you saved money. Shop with a plan. I never leave the house without concrete ideas and a list of what I am buying and for whom. And don't hit the stores willy-nilly. Go to the departments and aisles that have the items on your list, and do not detour to other areas of the store. You save money and precious time. My friends and I exchange birthday gifts but not holiday gifts. Instead, we get together at someone's house to enjoy a glass of wine and wrap presents together. By limiting gift buying to family, it's much easier to stay within my budget. I like to invent new ideas for saving during the holidays. One way is to come up with a theme for presents and then look for sales. One year I put together game-night packages, which included board games, dice games, or cards (and a green visor for the poker enthusiast). Another time, I created a movie-night motif. (Watch for DVD sales; some stores sell movies for $5 or $9, and you can put them together with popcorn, candy, etc.) Going with a theme helps me save money and is fun, because my whole family likes to get involved. I think back to the beloved PBS show Mister Rogers' Neighborhood, when Fred Rogers once proudly displayed one of his many signature cardigans -- knit by his mother. With that in mind, I focus on being thoughtful with each gift rather than mindlessly spending a lot of cash. I always keep candles and picture frames on hand that I've picked up for a few dollars on clearance. These small items suit everyone, so when you receive an unexpected present, you always have something ready to toss into a gift bag. To save money this holiday season, we will undergo major house renovations. Dollhouse renovations, that is. Instead of spending big bucks on less meaningful gifts for my daughter, we'll remodel a treasured toy that my grandfather crafted for me years ago. With just a few scraps of wallpaper, cedar pieces, and carpet remnants, a dusty relic will be recycled into a bit of Christmas joy. Our family sets an overall budget, then we break it down into how much to spend on extended family, decor, food, and one another. We get cash for that amount and that amount only. As a motivator to stay under budget, any money left over goes toward a fabulous New Year's party. I remember that Christmas was a holy day long before it was a holiday. I spread my gift giving throughout the year. I share my garden and flowers in the summer and fall and baked goods in the cooler weather; I open my home to others all year just to connect. These things seem to be more important to my friends and family than gifts with a bow. We opt for a family present. One year it was a basket filled with specialty items from the state we live in. On another occasion, it was a Frantz Family Favorites basket, for which my husband and I and all our children chose one thing that was a favorite at the moment. It had everything from jalapeño potato chips to lip balm to college car stickers. This year I have some old family photos that I will copy and put in a frame or a scrapbook. I'm sure it will get us laughing and bring back good memories. By realizing that what I buy for one day of the year is not as important as what I do the other 364 days. The 2nd-Annual Big Show-Off Talent Show will, once again, replace gifts. Everyone participates. Last year family members were treated to a play, a rendition of "Santa Baby," an art class, a dramatic poetry reading, magic tricks, and jokes. My husband and I chose to perform with a pair of raw Purdue chickens, singing and dancing to "The Twelve Days of Christmas" while the whole family joined in. Our memories will last much longer than gifts. Last year I bought everyone books. I chose one on photography for my brother, one about feng shui for my sister-in-law, copies of Jeff Kinney's series "Diary of a Wimpy Kid" for my children, and a coffee-table book on the Washington Redskins for my father. It saved me money, wrapping paper (I just used beautiful ribbon), and time. It was such a success that I plan on giving books again this Christmas. Recycle! My friends and I buy presents for one another from secondhand stores. We reuse gift bags and boxes from previous years and often present baked goods on old plates -- the pretty ones that are no longer part of a complete set. This year I am giving vintage recipe boxes (found at a secondhand store for a dollar or two) filled with my favorite recipe cards and a batch of my signature sweets, Oatmeal Scotchies. I make my holiday budget in January, just after all the past season's receipts are organized and the bills are paid. Having a budget based on real numbers and a full 12 months in which to plan helps me stay on track for next year's festivities. Last year I decided not to fly home for the holidays. Instead, I invited other holiday orphans over to my house for midday burritos and a movie. Everyone brought one ingredient for the meal, and we watched "Pirates of the Great Salt Lake," one of my favorite independent films, in front of the fireplace. One couple even came dressed as swashbucklers (complete with eye patches and swords) for the occasion. It was such a hit, I'm doing it again this year. Only this time, costumes are strongly encouraged for all! For years I hosted the traditional sit-down holiday dinner, but everyone would get so full on appetizers that they couldn't really enjoy the meal. Then, 10 years ago, I decided to replace that feast with just hors d'oeuvres, drinks, and desserts. It feels more like a lovely cocktail party, with people mingling and laughing. Cutting out the big, fancy dinner slashed a huge expense from my budget, and we still get to have wonderful holiday food -- just in smaller bites. I've learned that words from the heart are more valuable than what money can buy. I've written absurdly silly poems and little stories for my young niece and nephew, letters filled with recollections of treasured moments for others, and lists of things I adore about someone special. Recording my memories on paper is a gift for me as well as for the recipient. I host a snack-and-swap party for my girlfriends. Everyone brings over 8 to 10 things (clothing, books, household items, etc.) that she has never used, despite best intentions. We pour wine, eat cheese, display our goods, then "shop" for Christmas gifts in the comfort of my home. Inevitably we all find items that are perfect for our loved ones, without spending a dime. Each spring, I compile a list of gifts (scarves, afghans, dishcloths) that I can crochet for family, friends, and neighbors. I begin making things early so that when Thanksgiving and Christmas come around, I can relax and enjoy the holidays. It takes planning and time, but homemade gifts are cheaper and more personal. They come from the heart. In the fall, I make a note of which gifts each person would like, and I start comparison-shopping until I find the best deals -- even if that means buying my boyfriend's golf shoes in early November because that's when they are on sale. I enter every blog giveaway I can find. Certain sites, like bloggiveaways.blogspot.com, let you know where the free deals are happening. Last year I ended up winning most of my Christmas gifts: a darling handmade apron for my mother-in-law, jewelry for friends, candles to use as hostess gifts, books, a stuffed monkey for my daughter, and even a tie for my dad. I stopped buying gifts for people. I share my home; I share my help; I love them all year long. But I do make great cookies that they look forward to each December. I pay cash. No exceptions, and no post-holiday woes. I create homemade wrapping paper with stamped parchment or collaged magazine clippings. It makes packaging gifts a bit more personal -- and a lot more affordable. Instead of buying presents for all our relatives, together we adopt a needy family through our synagogue. We all go to the mall and pick out gifts. It not only is fun and rewarding but also turns out to be less taxing on our budgets. I shop all year long for things on sale that I know people will love, then stash them away. The biggest difficulty is remembering where I've hidden them. It took me 12 years to find a gift I bought for my husband the first year we were married: a Dilbert key chain and business-card holder. Fortunately, they were still relevant! We have family all over the country. I have one rule: All presents we send to our relatives must fit in a U.S. Postal Service flat-rate box. It keeps gifts small, and it also saves on shipping. I start with those after-Christmas clearance sales. I try to stock up on items I know people would like. If I find a great deal, I buy three or four of the same thing so I'll never be caught empty-handed. In addition to having less stress around the holidays, I save an incredible amount of money, and I can feel good about being generous with big presents that didn't cost as much as one might think. Making our gifts for family and friends helps us to spend less during the holidays. I once put my kids' painted footprints on a welcome mat for the grandparents. It was a great way to stay within my budget and give a personal gift at the same time. My family sticks to a $5 limit. You can go über-practical or über-silly. My favorite Christmas present last year? Toilet paper.